Walking the dog is great exercise — I know — I walk two collies at least twice a day. 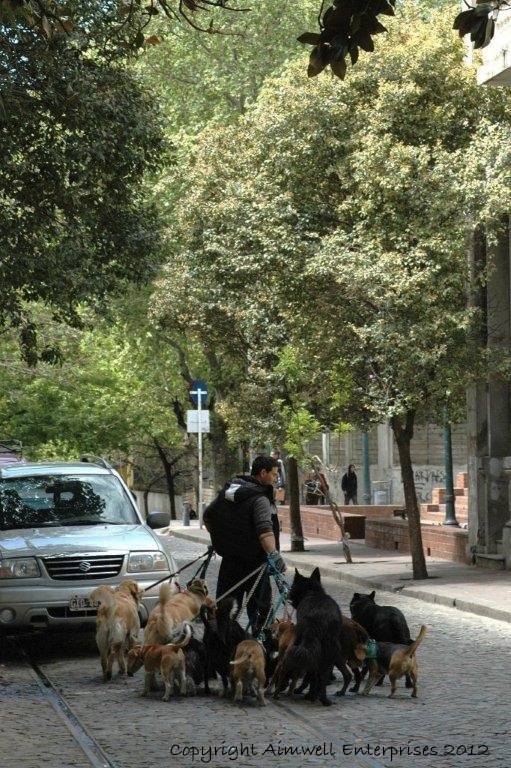 So, I was really impressed when I caught sight of this young man with his many canine charges in the affluent Recoleta neighbourhood of Buenos Aires. I haven’t been able to figure out just how many dogs he has in hand, but judging by the size of his arms and the gloves on his hands, this is something he does on a pretty regular basis. One of the wonderful things about travel is catching a slice of life you don’t expect … you just need to keep your eyes open and pay attention to what’s going on besides the obvious. This entry was posted in Animals, Life, Pets, Photography, Travel, Uncategorized and tagged Argentina, Buenos Aires, dogs, Photography, Travel. Bookmark the permalink. Amazing, the guy must have well over 10 dogs he is walking. Nice work. How on earth does he pick up after them? I’m guessing he doesn’t! That’s one guy I wouldn’t want to walk behind. Thanks, Stu … Good point … I hadn’t thought of that!